"Hooper" is pictured with Max Winch after winning Best in Group. 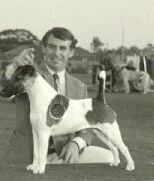 Hooper is the sire of Ch Blackfox ThBitch is Back and a full brother to Am Ch Blackfox Heir Apparent and Ch Blackfox Itanabit. Hooper, like his brother is very sound, good head, lay of shoulder and strong rear quarters.